Action for Education is an independent, grassroots organisation founded in the UK in 2017. We develop and support projects that aim to remove the barriers to education for displaced communities. The education project Refugee Education Chios was launched as a reaction to the desperate condition of refugees on the island of Chios – a critical bottleneck on the road of flight to Europe. While the refugees were worn out by insecurity about their future, nontransparent asylum procedures and deplorable conditions in the camps, we witnessed a great need amongst the children and youth for a daily structure, possibilities to learn and regular social interaction. AFE pursues two main goals with this project: first, we offer an essential safe space to the children and youth, in which they can rediscover a piece of childhood. Careful guidance in learning, playing and communal activities helps let young people be young people, an opportunity they are ill-afforded in the harsh, tense and frequently violent conditions in the camps. Second, we help students develop language and concentration as well as motor and cognitive skills through curricula of English, mathematics and projects, which also stimulate imagination and let students and participants explore their own interests old and new. We have developed a holistic non-formal education system that provides services for those aged between 15 and 22 years old from the refugee community currently based on Chios Island, Greece. Manage a team of 12-14 volunteer teachers, ensuring lessons are delivered to the standards set out by Action for Education. Onboard new volunteers into their role as teachers/youth workers, organise professional training and teaching resources for all volunteers. Ensure that there is absolutely zero tolerance for corporal punishment, abuse or aggression. Monitor and maintain professional practice within the team and service delivery. Carry out Child Protection and Professional Boundaries and Practice inductions and subsequent trainings. Respond to and record all safeguarding concerns. Make the appropriate safeguarding children and vulnerable adults referrals, and liaise with protection actors for follow-up or further safety planning where relevant. Attend inter-agency child protection working groups. Manage the weekly timetable alongside the other Programme Coordinators. Manage weekly meetings with the volunteer team. Discuss volunteer concerns to other Programme Directors and develop appropriate action to respond to such concerns. Ensure that proper documentation for attendance (class registers and trackers) are regularly completed by teachers. Work with volunteer teachers and youth centre coordinator to identify irregular attendance and manage communication to students to encourage them to return to school. Crew lead the school/youth centre shifts, ensuring the safe running of the programmes and responding to student/staff difficulties or crisis on site. Monitor donor and media visits ensuring all the required preparation is completed thoroughly and on-time. Monitor and maintain the development and delivery of the project’s core curriculum. Maintain the day to day running and administration of the education service. Liaise in a timely and appropriate manner with partner agencies. Develop and implement policies and practices to continuously improve AFE service delivery. You hold at least a degree in teaching, social work, youth work or other relevant studies. You possess knowledge of the higher education sector, non-formal education or are experienced in non-academic, pedagogic fields of action. You have relevant knowledge, experience or understanding of the situation in Greece/on Chios regarding the hot spot system and the injustices of the current asylum arrangement. You have a strong understanding of humanitarian standards, INEE minimum standards, and child protection principles. You have a clear and applicable knowledge and/or experience of safeguarding children and vulnerable adults. You have knowledge, experience and/or understanding of the impact of trauma on young people and how to safely respond to and manage high levels of distress. You are approachable and hold strong interpersonal skills. You maintain professionalism and are adept in the implementation of quality services. You hold strong verbal and written communication skills, including ability to compile and present briefings and reports to a variety of audiences. You have strong analytical, problem-solving, and planning skills. You demonstrate resourceful and strategic thinking. You are a multi-tasker who performs well under pressure. A chance to work in a unique and driven organisation with an amazing team. Are you interested? 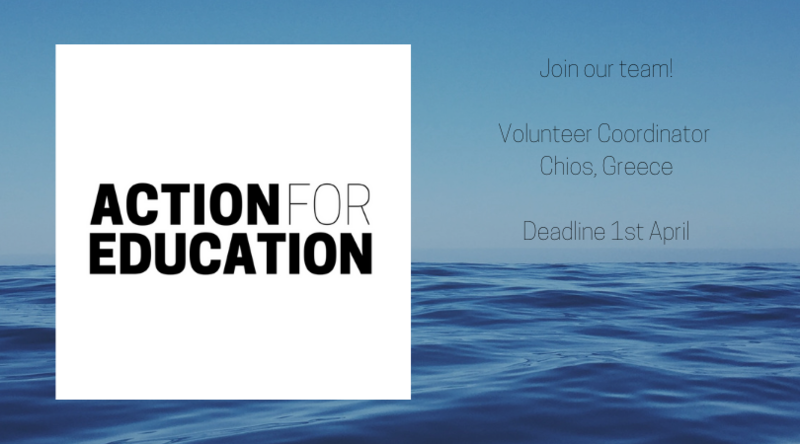 Then apply for this position by emailing volunteer@actionforeducation.co.uk with the object “Volunteer Coordinator Chios”. All applicants must send a cover letter and an updated CV (no longer than 4 pages). Both must be in English. Applications close on the 1st of April. Applications submitted after this date will not be considered. Older PostVolunteer online with us: announcing new remote roles!